1 : 570 Revell 18"
It was the summer of 1999, and we'd just finished building our first two Titanic models. These were the larger Academy-Minicraft 30-inchers of the same type featured in our later videos, but these were for display only (one for us, and one commissioned by a friend). 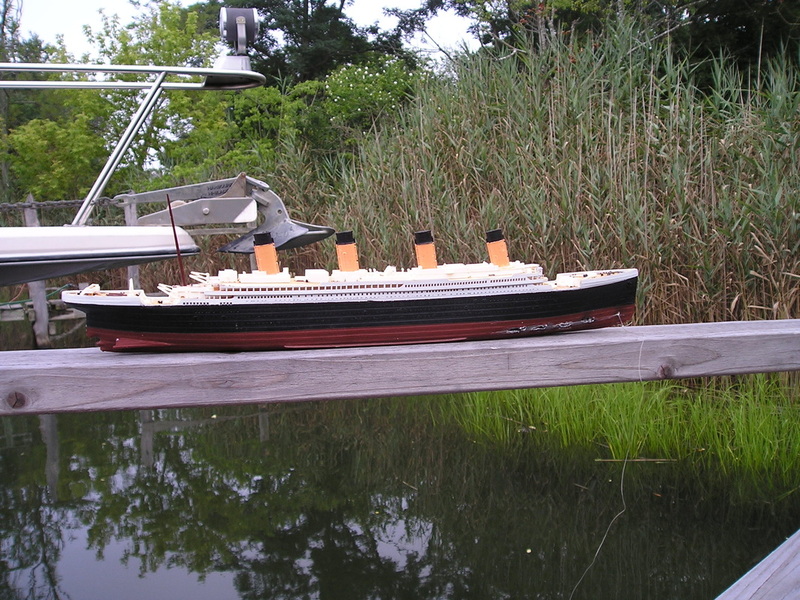 We'd also recently completed a sinking aircraft carrier model, built with bulkheads like the Titanic's so it would sink "correctly." After that experiment was a success, we decided to build our first sinking Titanic model. This Revell 18" kit was the result. Though this kit is also meant for display only, we modified it. Our version has somewhere between 8-10 compartments on the interior, separated by bulkheads made of scrap plastic (old floppy disks, expired credit cards, and the like). We carved some iceberg damage into the bow using a heated Exacto knife, and weighted the hull with lead ballast (fishing sinkers melted with a blow torch and poured into tuna-can molds to fit into the hull). The reason none of these molten-metal activities resulted in our dismemberment, by the way, is because we were very safe. If you're planning on building one of these, there are easier and safer ways to achieve the same ends - if you're a youngster, we don't advocate open flame, melted lead, or hot knives! After the very elaborate Academy-Minicraft models, this Revell kit was a cinch! We finished up the build in a few days, tied a fishing line to the bow for recovery (a lesson learned when we'd almost lost the aircraft carrier mentioned before), and put her in the water. 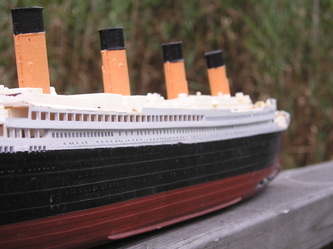 She sank very much like the original, and we were happy with the result. Some years later, in 2007, we decided to take some video of this model. By that time, the rigors of time, careless storage, and repeated sinkings had taken their toll: the foremast had broken off, along with all three propellers and a good portion of the rudder. 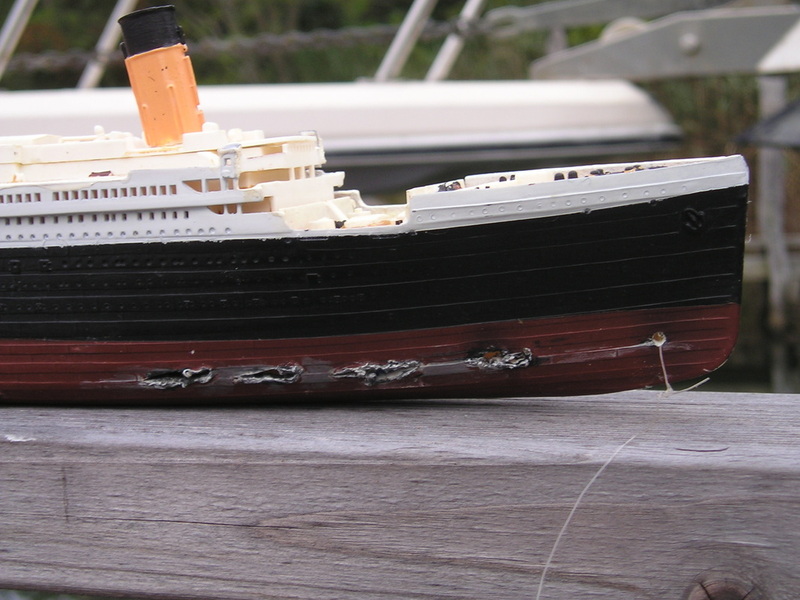 The watertight bulkheads were crumbling a bit as well, so the sinking was much less accurate than it had been. But we had a new YouTube account and an itchy camera shutter finger, so we gave it a go. Four years later, videos of this model are our most-viewed, having reached millions of people worldwide. As our methods and technology improved, we began shooting video that (hopefully) doesn't look quite as amateurish. 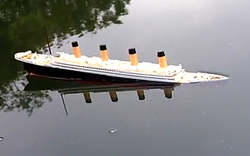 Our sinking-Titanic focus has since shifted to ever-bigger and better incarnations. Today, after hundreds of sinkings, "the one that started it all" is enjoying a well-earned retirement on one of the many shelves abutting the RapidNadion W&M Shipyards.